In a talk entitled, Cult Bashers are Con Artists, the main spokesperson for the Desteni organisation, Bernard Poolman tells listeners to be aware that exit counselor / cult expert, Rick Ross and others express ideas about Desteni being a cult in a confident way and can thereby instill fear. Desteni seems to be an enterprise essentially dominated by Poolman and personality-driven. It apparently contains his conspiracy theories, seemingly denigrates the outside world and perhaps ultimately serves as a 'cash cow', which Poolman seems to milk for his income. In my opinion Desteni can easily be seen as a 'cult-like' and potentially unsafe group. But it doesn't take an expert to figure it out: anyone can see Desteni is quite obviously a New Age-style 'channeling' cult running a Multi-Level Marketing scheme. At the Soulpancake website recently one concerned individual wrote that the Desteni website 'screams "CULT"'. Another describes it as 'a poor man's Scientology'. Similar observations have been made on countless other websites and forums: the Skeptic Project, David Icke's Official Forums, the 2012 Hoax, the Ex Scientologist Message Board, Above Top Secret, Godlike Productions and many more. Mr Poolman repeats his catch phrase, 'what is best for all', as if Desteni has to be 'what is best for all'. It is common knowledge that cults always claim to be best for all. That is partly what makes them cults. Naturally, being cult members, those persons identifying themselves as 'Destonians' will tend to resist awareness of how cults operate. That is, in this instance with repeated use of jargon and catch phrases and claims towards being the only group in the world that is for the universal greater good. Cults usually present themselves as unfairly persecuted by fear-mongers and liars. At the Destonian Wiki, this blog is described as 'Internet Bullying, Propagation of Lies, Individual Harassment'. URLs of this blog and many but not all of the YouTube channels criticising Desteni are listed with the warning that the reader may visit these sites 'at your own risk', as if it is somehow dangerous to read a blog or website or watch a video that merely criticises, mocks or satirises Desteni. Criticising, mocking or satirising statements of a group or individual in blogs, forums or videos is not the same thing as 'internet bullying' or 'individual harassment'. Neither is it perpetrating a scam or hoax, as Desteni also claim. In Cult Bashers are Con Artists, Poolman repeats another of his tiresome slogans, 'the actual practical message of Jesus', which is what he says his group represents. Then he makes an even more ludicrous statement: that atheism is also 'the message of Jesus'. Cult leaders have very often claimed their groups represent the message of Jesus. And cults like Jim Jones' People's Temple, Heaven's Gate, Aum Shinrikyo, The Order of the Solar Temple also made doomsday predictions. In 2007, Desteni released a document stating that 'Heaven will withdraw World Leaders, Political Leaders, Religious Leaders, Corporate Leaders and Crime Leaders in months to come' and that 'Children will be able to see Beings from Heaven everywhere and communicate freely'. In a supposed 'portalling' of Edgar Cayce (1877–1945), doomsday prophecies were made by the Desteni group about world-wide tsunamis, hurricanes, tornadoes, massive earthquakes, snowstorms, volcanic eruptions. 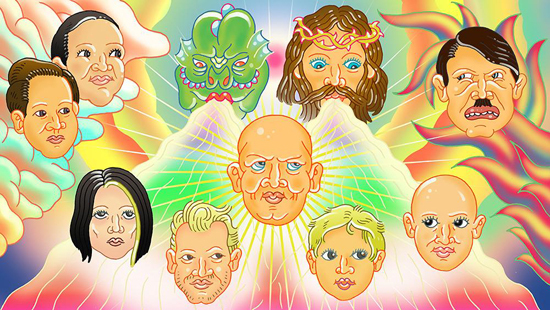 After their main channels were terminated in 2011 by YouTube for 'spam, scams and commercially deceptive content', and Vimeo for violation of the terms of contract, and they had become known for sporting skinheads, the 'principles of equality and oneness' group abandoned their FaceWorldFaceOff campaign to 'get at least 100 million people to shave off their hair as a statement of Standing up in no longer participation in the hair industry'. They voluntarily removed content pertaining to Adolf Hitler from their website. They began blogging about their need for self-forgiveness on a daily basis, branding it as a 'seven-year Journey to Life'. After initially predicting that their 'Equal Money System' would by 2020 start to become the inevitable outcome of everyone in the world voting for it, they reduced it to a 'research and development Project to formulate and investigate responses to general policies'. They launched an offshoot business selling the Techno Tutor software at an extortionate price. They have published numerous translations of their material in various languages. They have offered cut-price and 'blogging for sponsorship' deals for courses in Desteni 'self-mastery'. None of this seems to have made any difference to their membership count. Their free Desteni I Process Lite course is another attempt to increase numbers but as with their other schemes typically lacks both the potential for popular appeal and any business acumen. Not only do Destonians appear incapable of addressing the question of the cult-like attributes of their group, they fail to recognise that 'Desteni' has no social, cultural or political credibility. Unsurprisingly, since 2007, after publishing thousands of videos, articles and hundreds of blogs, Desteni have still only recruited around 100-150 active participants world-wide. and this false cult as 1.436 likes on facebook page, whatever the majority of them are not active. And let's not forget the program was stole from his polman brother and change everything, being false people in front of many eyes. sorry my english, but that's the true, they are false, and that's what they are going to be. by the way, will you peopel still psoting here? Since they were banned from YouTube Desteni have slipped under the radar somewhat. It seems that they are trying to avoid further criticism by keeping a low profile and not drawing attention to themselves as much as they did before. Interest in the group, both as a cult and for whatever it pretends to be, appears to be on the wane, which is probably why there have been no posts recently about it at the Cult Education Forum. More ex-members need to speak out against Desteni and provide new and relevant evidence which exposes them.